Trainer Paul Nicholls holds the record for Haldon Gold Cup winners, and has a serious contender for this year's renewal at Exeter on Tuesday. 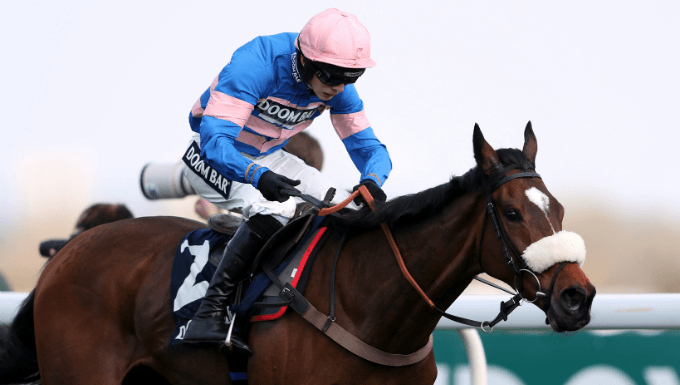 It's the first big mid-week race of the new jumps season, and Nicholls's Diego Du Charmil is all the rage in the Haldon Gold Cup betting, given odds of 5/2 by all the online bookmakers. Can he give the trainer a seventh win in the Grade 2? What is the Haldon Gold Cup? The Haldon Gold Cup is a Grade 2 Limited Handicap Chase run over 2m1½f at Exeter. Worth £70,000, it has been won by some of the best two-mile chasers in history, including Sabin Du Loir (1990-91) and Edredon Bleu (2002-03) - two dual winners - and Nicky Henderson’s Travado, a three-time winner between 1993 and 1995. Grade 1 winner Diego Du Charmil (nap) has always gone well fresh on his first start of the season. Even his debut for the Paul Nicholls resulted in a narrow margin success in the Fred Winter Handicap Hurdle at the Cheltenham Festival. Victory on his return in October 2016 at Chepstow and of his first ever chase start at Newton Abbot in September of last year further back up that statement, so it's a good sign that he hasn't run since April. In that same month, the six-year-old recovered from a serious injury to win a Grade 1 at the Grand National meeting on ground softer than ideal, and he has been trained with this as his first target of the season, so the 5/2 (Ladbrokes) looks very fair for a deserving favourite. Nicholls’ second string, San Benedeto (13/2 Coral), has shown some high-class form over fences and gave Altior something to think about in the Grade 1 Celebration Chase at Sandown last April. He has Bryony Frost’s 3lb allowance and should tighten up after a return effort over hurdles at Kempton, behind the impressive Verdana Blue. Ozzie The Oscar (3/1 Ladbrokes) warmed up for the Haldon Gold Cup with a spin in the Welsh Champion Hurdle, finishing third to Silver Streak by three lengths. He returns back to fences in an attempt to make it three on the bounce in this sphere, but his Philip Hobbs-trained stable mate makes more appeal. Garde La Victoire(12/1 Coral) shaped well for a long way on his return at Chepstow last month. In a strong handicap, he finished behind Charbel, looking in need of the outing, and was then dropped 2lb for his fourth-placed effort. His last win over fences came at Sandown in January 2017, off a 7lb higher mark than he races off at Exeter and ground conditions will pose no issue whatever it turns up on the day. It seems strange that Saint Calvados, a horse who beat Diego Du Charmil by a staggering 22 lengths in the Kingmaker Novices Chase at Warwick, is available at over double the price - 6/1 with Coral. A French import, he rattled off a sequence in novice chases last season, before going up against the top 2m novice chasers in the Arkle at Cheltenham. That performance was a write-off as he and Petit Mouchoir set a ferocious pace, neither of which were able to keep up, making themselves vulnerable to winner Footpad. That said, all of Saint Calvados's successes have come on soft/heavy ground and he would need a biblical proportion of rain to get the conditions he desires - it's wise not to bet on this Haldon Gold Cup runner. King’s Socks (14/1 Ladbrokes) represents trainer David Pipe and was fancied for a couple of big handicaps last season. Sent off at 7/1 for the Brown Advisory & Merriebelle Plate at the Cheltenham Festival, he travelled like the best horse for 80% of the chase, but hung left after coming off the bridle in the home straight, then finished fifth to The Storyteller. That ensured he was sent off a well-backed favourite for the Red Rum at Aintree, dropped back in trip to 2m, but he ran a lifeless race and was pulled up before the third-last. On his old French form, he looks well-handicapped, with his second to Arkle winner Footpad in a Grade 1 hurdle at Auteuil a strong piece of form, but he needs to prove himself in Britain.